The Zodiac Sign Libra Woman (September 23 - October 22), Libra Personality Traits for Female born under September Zodiac signs. Libra woman is always charming, beautiful, elegant and very feminine, although sometimes her cold rationality carries a truly masculine logic. She easily communicates, can support any conversation, but enters into a dispute only when she is really sure of her right. She does not strive to show the world her intelligence and practicality, but those around her constantly notice her wisdom, even in usual practical, everyday affairs. She is very tactful, and will not go over the head to make a career, but will not hide behind others when she is chosen to a higher position. She assesses every object from all sides, the Libra woman discusses every moment of life both from the negative and positive position. This allows her to analyze and draw correct conclusions and, accordingly, apply the experience in later life. The Libra woman before making each move, carefully thinks over it in her manner, and if she undertakes it - it will be correct. Unluckily for her, often variations of "for" and "against" so undermine the construction of peace, that she decides to stay put, without taking any decision until the foundation of her life comes back to normal. Thus, the Libra woman often loses some good opportunities to better her life, preferring not to make any decision. The Libra woman should double check that her solution in any activity to get it right, and so that no details were missed, and that she has everything to do the job. This representative of the zodiacal circle with her seeming self-sufficiency, absolutely cannot be alone. She constantly needs support because in life she should focus herself on someone, someone to verify her actions and decisions. It's better if it is a person whom she respects, and whose opinion she puts above hers, because the Libra woman will never fully reveal herself to a weaker partner in affairs and in personal life. She knows how to make money, the Libra woman needs funds to keep her home in good order and maintain the image of a stylish and elegant lady. She skillfully conceals her rough male traits under a beautiful dress, soft makeup and a stylish haircut, she is always shown like a feminine outwardly, even if she wears trousers and a tie. A man who Libra woman will love with all her heart may discover her for himself and see all the richness of her soul and inner peace. For her loved one, the Libra woman will do he wants, she will carry out his every whim and desires, looking him in the mouth. 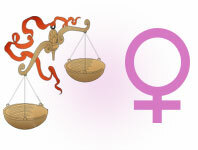 Libra woman avoids extra responsibility at work, but she can be an excellent source of advice to her beloved man. She was so gently and softly tells him that partners sometimes think that this - his own thoughts and desires. She is a smart and very shrewd manipulator who skillfully influences her partner for the best result in his activities. It is the Libra woman that can make her husband-soldier to become a general, methodically guiding him along that path. In personal life, Libra woman will always strive for balance and harmony, she hates squabbles, gossip and scandals - anything that destroys a family. She can create an environment at home that her lover will feel secure and happy. Libra woman can successfully combine her own career with family responsibilities, but if she has to choose between these important areas of her life, she will choose the family, remaining a caring mother and wife. Libra woman is strong with her softness and her soft inner strength, which is never destructive or rough. Full description of Libra Woman, character traits and personality characteristic for female Libra.